Francis RICHARDSON (1681 -1755) was Alex’s 8th Great Grandfather, one of 512 in this generation of the Shaw line. Francis Richardson was born 15 Jan 1680/81 in Woburn, Mass. His parents were Stephen RICHARDSON and Abigail WYMAN. He married Sarah HOUGHTON on 7 Jul 1708 in Charleston, MA. Francis died 31 Dec 1755 in Attleboro, Mass. Sarah Houghton was born about 1686 in Lancaster Mass. Her parents were Jonas HOUGHTON and Mary BURBEEN. 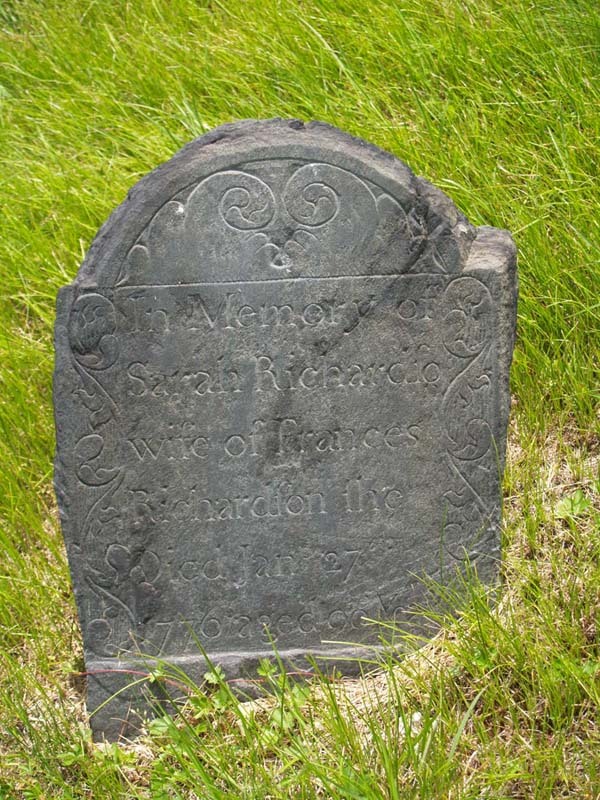 Sarah died 17 Jan 1770 in Attleboro Mass..
Sarah’s husband John Campbell was born about 1704. Francis’ wife Margaret (Margret) Carpenter was born 30 Mar 1712 in Attleboro, Bristol, Mass. 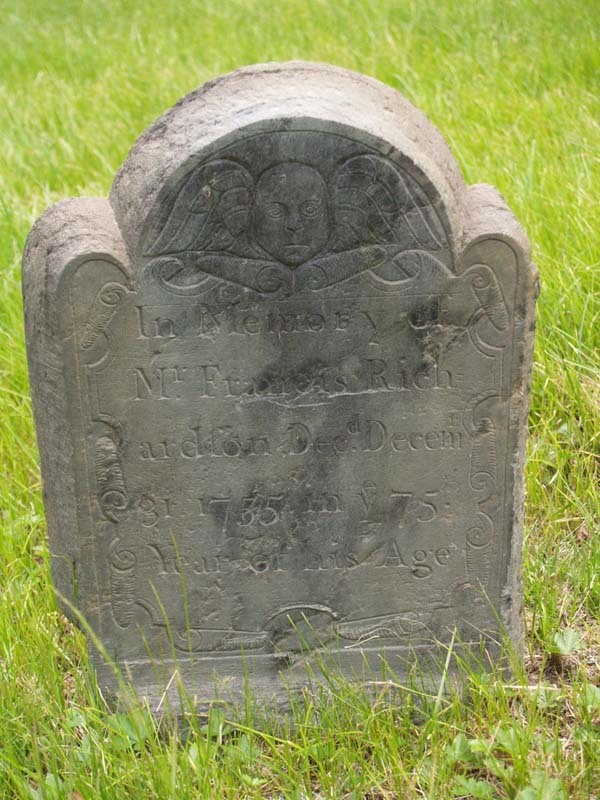 Her parents were Noah Carpenter (1672 – 1756) and Sarah Johnson (1680 – 1726) Margaret died 12 May 1753 in Attleboro. Francis died before his 38th birthday and his three surviving children were just 6, 4 and 2 years old. Margaret died in 1753 when the children were just 11, 9, and 7 and Francis’ brother Jonas became their guardian. iv. Margaret Richardson b. 25 Aug 1746 Attleboro, Bristol, Mass; m. 1 Nov 1766 Attleboro to John Marten Margaret and John had seven children born between 1768 and 1784. Mary’s husband Samuel Tiffany was born 7 Apr 1701 – Providence, Rhode Island. His parents were James Tiffany (1666 – 1732) and Bethiah [Fuller?] ( – 1711). 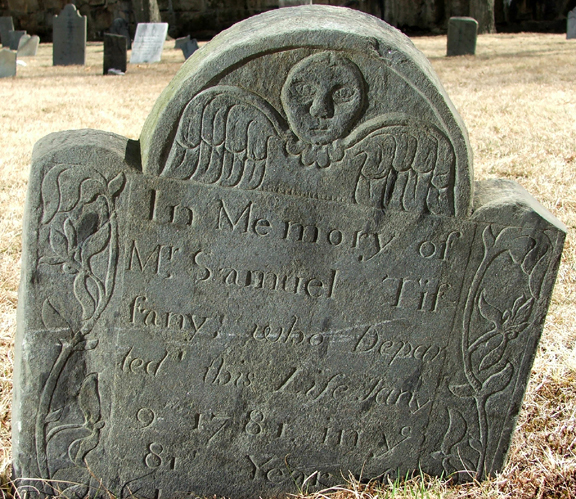 Samuel died 9 Jan 1781 in Attleboro, Bristol, Mass. Samuel Tiffany Headstone — Old Kirk Yard, Attleboro, Bristol County, Mass. i. Daniel Tiffany b. 8 May 1736 Attleboro, Bristol, Mass; d. 24 Mar 1812 Attleboro; m. int. 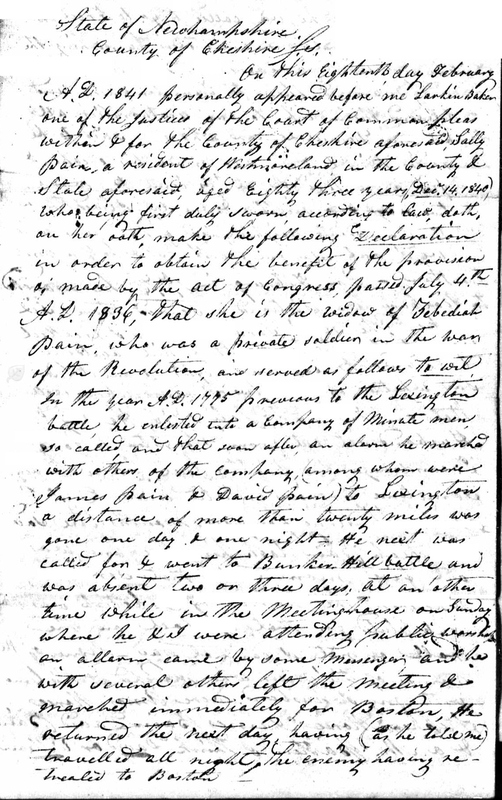 13 Feb 1762 in Attleboro to Bersheba Balcom (b. 18 Feb 1735 in Attleborough, Bristol, Mass. – d. 12 Dec 1815 in Attleborough, Bristol, Mass.) Bersheba’s parents were John Balcom (1699 – 1782) and Sarah Grover (1709 – 1756) Bersheba’s grandparents were our ancestors Alexander BALCOM and Sarah WOODCOCK. Daniel’s brother Samuel married Bersheba’s cousin once removed Hannah (See above). Daniel and Bersheba had seven children born between 1762 and 1773. After Daniel died, Bersheba married Benjamin Lindsay. Samuel Tiffany Jr, Attleborough, was a private in Capt. Stephen Richardson’s (Attleborough) company of Minutemen which marched on the alarm of April 19, 1775; service, 6 days; He enlisted into the army May 15, 1775 as a Corporal in Capt. Moses Knapp’s company, Col. Joseph Read’s regiment; company return dated Roxbury, Sept. 25, 1775; also, order for bounty coat dated Camp at Roxbury, Nov. 21, 1775; also, Corporal, Capt. Stephen Richardson’s 4th (2d Attleborough, also given Attleborough No. 12) co., Col. John Daggett’s regiment. ; list of men who were in the 8 months service at Roxbury in 1775, known as the 1st campaign. Jonas’ wife Mary Cutting was born 1717 in Sudbury, Middlesex, Mass. Her parents were Hezekiah Cutting and Mary Hagar. Mary died 27 Nov 1786 – Gloucester, Essex, Mass. i. Sarah Richardson b. 7 Oct 1742 Attleboro, Bristol, Mass; d. 16 Nov 1815 Claremont, Sullivan, New Hampshire; m. 23 Dec 1769 in Attleboro to Samuel Balcom (b. 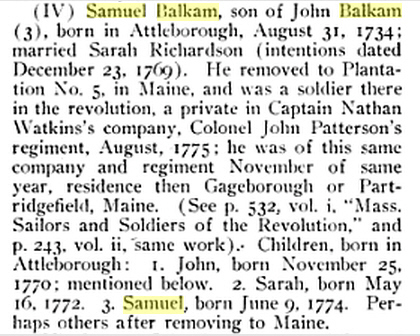 31 Aug 1734 – d. 20 Jan 1810 in Attleboro) Samuel’s parents were John Balcom (1699 – 1782) and Sarah Grover (1709 – 1756) and his grandparents were our ancestors Alexander BALCOM and Sarah WOODCOCK. Sarah’s cousin Daniel Tiffany married Samuel’s sister Bersheba and her cousin Samuel Tiffany married Samuel’s cousin once removed Hannah. Sarah and Samuel had seven children born between 1769 and 1790 including General John Balkam. Alternatively, Sarah married 30 Jan 1762 (int.) Attleboro to Jonathan Shaw (b. 20 Jul 1739 in Norton, Bristol, Mass.) Jonathan’s parents were Ichabod Shaw (1704 – ) and Sarah Aldrich (~1706 – ) There is a Jonathan Shaw buried in the West Claremont Burying Ground who died 8 Aug 1810 age 71. He might have been the man whose sons Jonathan and Royal went to the Eastern Townships in Quebec. Both these sons married daughters of Sarah’s brother Jeddediah Richardson so maybe this marriage is the correct one. He might have been the Jonathan Shaw who was born in Norton, MA in 1739 and married Sarah Richardson in Attleboro in 1762.
iii. Jedediah Richardson b. 28 Mar 1747 Attleboro, Bristol, Mass; d. 16 Dec 1838 Shipton, Richmond, Quebec; m. 1768 to his second cousin Mary Richardson (b. 8 Mar 1751 in Attleboro; d. Canada) Mary’s parents were William Richardson (1712 – 1773) and Mary Coy (spelled Cory in her marriage intentions). Her grandparents were William Richardson (1678 – 1749) and Rebecca Vinton (1683 – 1774) and her great grandparents were Stephen RICHARDSON and Abigail WYMAN. Jeddediah and Mary had eleven children born between 1768 and 1796. Of seven inferior judges, Capt. Stephen Richardson was one. March 19, 1776, he was chosen a member of the ” Committee of Correspondence, Inspection, and Safety.” May 22, 1776, he was chosen one of a committee of five to prepare instructions to the representative of the town, Capt. John Stearns. Among other things, it was enjoined on the representative, that if the Continental Congress should declare the country independent of Great Britain, he should, in behalf of the town, sustain and defend them in so doing. Jan 12, 1778, Col. Stephen Richardson,his brother, Capt. Caleb Richardson, and five others, were chosen to prepare instructions to the representatives of the town, relative to the Articles of Confederation. Col. Stephen Richardson and two others were chosen, Aug. 2, 1779, members of the convention to meet at Concord the following October, for the purpose of forming a State Constitution. 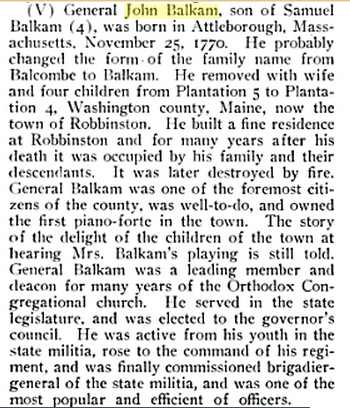 He was a representative of the town of Attleboro in 1783 and 1785. Jedediah sold land in Claremont, NH in 1799, but there is no record of how he acquired it in the first place. He apparently crossed the border to the Eastern Townships of Quebec before 1811. 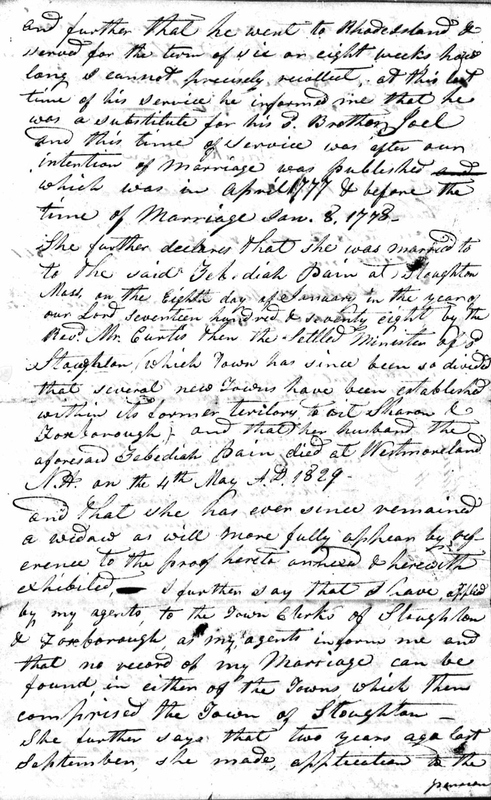 A petition to lease lot 28, 4th range in Shipton in 1811 was granted by King George III. On 24 Nov 1824, he petitioned to retain an undeveloped portion of that land and claimed that he was 79, ill, and had been deprived of the labour of two of his sons during the late war with the United States. That he had been disabled in a fall from a load of hay and that he had been in Shipton with his wife about 18 years (which seems slightly exaggerated). 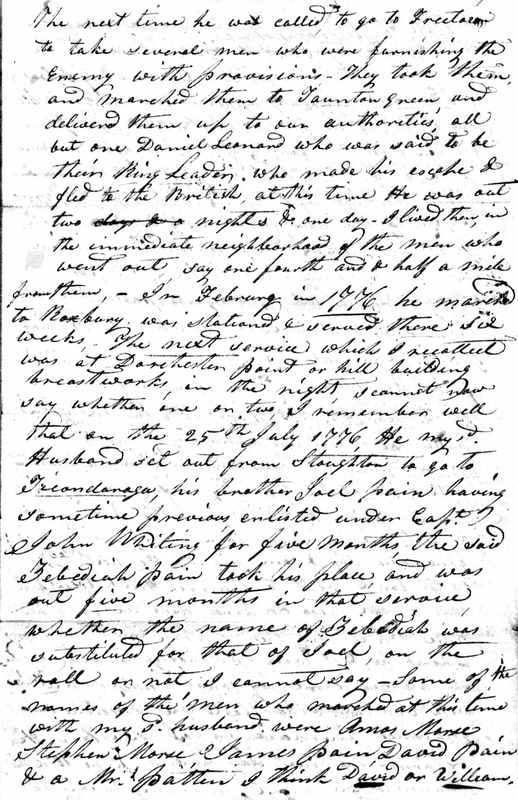 Three witnesses attested to his age, illness, and the absence of his sons.It is likely, if unproved, that he is identical with the Jedediah Richardson who was born and married in Attleboro. Jedediah of Attleboro marched as fifer to the Battle of Lexington against the British in 1775. It’s ironic that 37 years later, in 1812, he watched two of his sons go to war for the British and against the United States. Richardson, Jedediah, Attleborough. Fifer, Capt. Moses Willmarth’s (9th) co., Col. John Daggett’s (4th Bristol Co.) regt., which marched in response to the alarm of April 19, 1775; service, 7 days; also, Capt. Stephen Richardson’s 4th (2nd Attleborough, also given Attleborough No. 12) company, Col. John Daggett’s regiment. ; list of men who were in the 8 months service at Roxbury in 1775, known as the 1st campaign; also, list of men belonging to Capt. Richardson’s co. of No. 12 Attleborough who hired for the Grand Campaign of all for 3 years or during the war; said Richardson, with others, hired Samuel Bentley. Jedediah, Private, Capt. Alexander Foster’s co., Col. Isaac Dean’s regt. ; marched July 31, 1780; discharged Aug. 8, 1780; service, 10 days, including 2 days (36 miles) travel home; company marched to Tiverton, R. I., on the alarm of July 31, 1780. Roll sworn to at Attleborough. Abigail’s husband Ezekiel Fuller was born 9 May 1721 in Attleboro, Bristol, Mass. His parents were Ezekiel Fuller (1695 – 1776) and Elizabeth Thompson (1696 – 1725). After Mary died in 1763, he married 1 Mar 1771 in Salisbury, Litchfield, CT to Hannah Dutcher (b. 25 Mar 1749 in Salisbury,CT – d. 1830 in Salisbury) Ezekiel died 1824 in Salisbury, CT. Many of Samuel’s near relatives settled in Vermont and New York. In 1790 Luther, Ambrose, Timothy, Solomon, Jesse, Jesse Jr., James, Gilbert H., Edward, Eber, Charles and Abner were heads of families in New Haven, Salisbury, Middlebury, Sunderland and other towns in Vermont. Many of the Vermont families afterward moved to New York and westward. Amos, Jonathan and Solomon were heads of families in Massachusetts, in 1790, according to the first federal census. Luther Everts, of Lanesborough, and Judah Everts, of Stockbridge, were soldiers from Massachusetts in the revolution. Ebenezer Everts, a brother of Samuel Everts, settled in the town of Mexico, Oswego county, New York, in 1804, clearing a farm in the southwest part of the town, and had sons Frederick and Philo Everts. Samuel Everts came to Mexico about 1804 and settled on the farm which his descendants still own and occupy. Samuel married, September 10, 1771, Sarah Fuller. Their sons Elijah, Walter, Samuel and Luther Everts took up farms in Mexico. Children of Samuel Gillette and Sarah Everts : Elijah. Samuel, Walter, Luther, Electa, Sarah, Asenath, Olive and Julia. Sarah’s half sister Esther also moved to Mexico, NY. Mexico, with all the surrounding towns, was originally created from Whitestown, Herkimer County, on April 10, 1792 by the State Land Commissioner. The original organization of Mexico was abandoned for a time. In December of 1794, George Frederick William Augustus Scriba purchased and patented a large tract of land; subsequently becoming a second Mexico (hence the Village of Mexico, and the Town of Mexico. George Scriba also later opened roads traveling from what is now Mexico Point to present-day Constantia, as well as a highway to present-day Oswego. Settlers grew quickly in both the Town and Village of Mexico. Thus, the presence of roads, log cabins, frame houses, and businesses. Mexico’s early businesses included saw mills, oil-mills, gristmills, asheries, tanneries, blacksmiths, tinsmiths, coopers, cheese plants, cloth-dressings, distilleries, shoe-shops, hotels, general merchandise, and jewelers. iii. Ezekiel Fuller b. 1 Jan 1751 in Smithfield, Providence, RI; d. 26 Mar 1824 – Sheffield, Berkshire, Mass; m. 1 May 1771 – Columbia, Tolland, CT to Hannah or Anna Dutcher (b. 25 Mar 1749 in Salisbury, Litchfield, CT – d. ~ 1811) Ezekiel and Hannah had ten children born between 1772 and 1796.
vi. Abigail Fuller b. 29 Dec 1757 in Smithfield, Providence, RI; d. 1835; m. 1 Dec 1779 at West Side Congregational Church in Providence, Providence, RI to her first cousin Benjamin Fuller ( b ~1754) Benjamin’s parents were George Fuller (1725 – 1755) and Sarah White. His grandparents were Ezekiel Fuller (1696 – 1776) and Elizabeth Thompson (1696 – 1725) Abigail and Benjamin had seven children born between 1780 and 1800. Thomas’ first wife Esther Wellman was born 21 Oct 1723, 1 Nov 1726 or 1 Nov 1727 in Attleboro, Bristol, Mass. Her parents were Samuel Wellman ( – 1770) and Charity Hall (1704 – 1773). Esther died 5 Feb 1795 in Nelson, Cheshire, New Hampshire. Thomas’ second wife Judith Cobb was born in 1731. Judith died 17 May 1809 in Nelson, Cheshire, New Hampshire. i. John Richardson b. 14 Aug 1750 Attleboro, Bristol, Mass; d. 14 Aug 1814 Nelson, Cheshire, New Hampshire; m. 18 Nov 1773 in Sharon, Mass to Dorothy Vining (b. 8 Jan 1752 in Abington, Mass. – d. 4 Jan 1833 in Nelson, Cheshire, New Hampshire); Dorothy’s parents were Josiah Vining (1729 – 1774) and Hannah Abigail Dawes (1728 – ) John and Dorothy had eleven children born between 1774 and 1796.
iii. Sarah Richardson b. 12 Dec 1757 Attleboro, Bristol, Mass; d. aft. 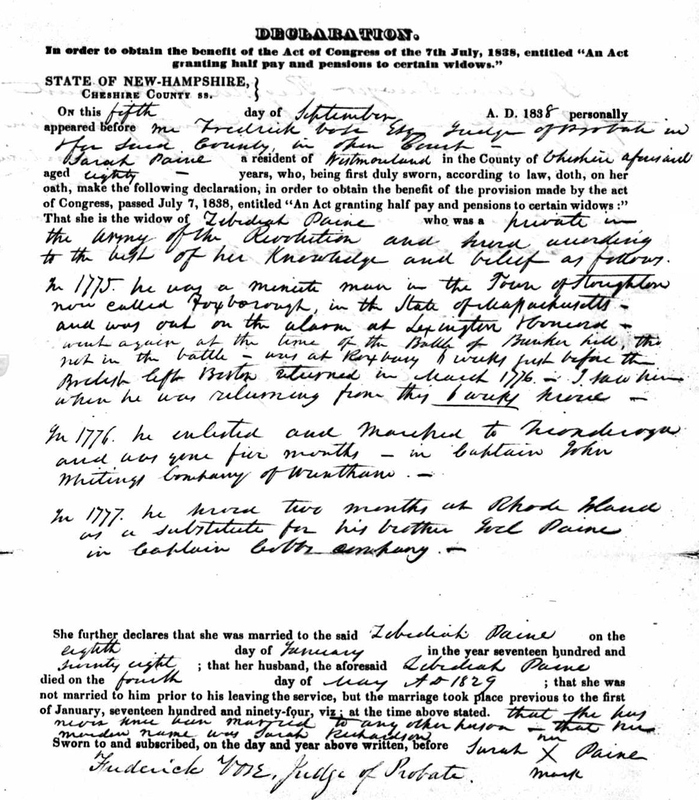 18 Feb 1841 pension appl. Westmoreland, Cheshire, New Hampshire; m. 8 Jan 1778 in Stoughton, Mass to Zebediah Paine (b. 1763 in Foxborough, Norfolk, Mass. – d. 1845 in Foxborough, Norfolk, Mass.) Zebediah’s parents were Edward Paine (1724 – 1784) and Elizabeth Tiffany (1725 – ). Sarah and Zebediah had eight children born between 1780 and 1800. Sarah’s widow’s request for Zebediah’s revolutionary war pension was rejected. Ebenezer’s wife Sarah Cummings was born 2 Apr 1731 in Attleboro, Bristol, Mass. She was Ebenezer’s first cousin. Her parents were Abraham Cummings (1690 – 1755) and Mary Richardson (1689 – 1755). Sarah died in 1758. Ebenezer’s second wife Esther Cheney was born 25 Mar 1738 in Norton, Bristol, Mass. Her parents were Benjamin Cheney and Keziah Newland. Esther died 16 Mar 1781 in Attleboro, Bristol, Mass. iii. Dorcas Richardson b. 15 Dec 1756 Attleboro, Bristol, Mass; d. 1796 Colebrook, Litchfield, CT; m. 31 Dec 1781 Mansfield, Bristol, Mass to Ephraim White (b. 3 Jan 1754 in Mansfield, Bristol, Mass, – d. 23 Aug 1843 in Colebrook, Litchfield, CT) Ephraim’s parents were Ebenezer White Sr (1697 – 1784) and Sarah Caswell (1712 – 1766) Dorcas and Ephraim had five children born between 1782 and 1794. Ephraim was a soldier in the Revolution for six years. While a resident of Bristol County, Massachusetts, he enlisted in Connecticut about the last of April 1775, served as a private in Captain Ezekial Scott’s company, Colonel Samuel Wyllys’ Connecticut regiment, at Boston, and was discharged during the “fore part” of December, in Massachusetts; he re-enlisted late in December, served one year as a Private in Captain Abraham Tyler’s company, Colonel Jedediah Huntington‘s Connecticut regiment, during which service he was stationed at Boston until after the evacuation of the British, went to New York and Long Island, and was discharged in New Jersey. He enlisted March 7, 1777, served as Corporal and Sergeant in Captain Moses Knapp’s company, Colonel William Shepard‘s 4th Massachusetts regiment and was discharged March 7, 1780, at the Highlands in New York. He served subsequently three weeks in Captain Keith’s Massachusetts company and another three weeks in the Massachusetts troops, names of officers not shown. 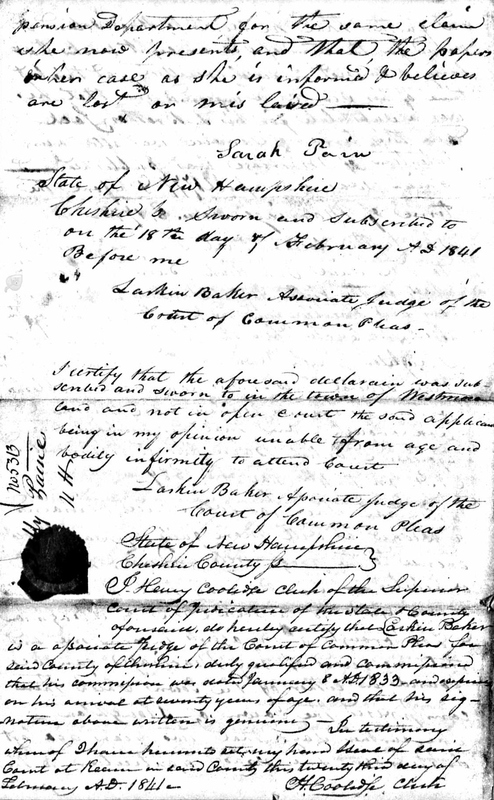 Ephraim White was allowed pension on his application executed April 9, 1818, at which time he resided in Colebrook, Litchfield County, Connecticut. He continued to reside there until his death on August 23, 1843.
iv. Ebenezer Richardson b. 19 Jan 1758 Attleboro, Bristol, Mass; d. 4 Aug 1820; m. 17 Oct 1793 Mansfield, Bristol, Mass to Betsey Fisher (b. 26 Jul 1778 in Mansfield – d. 15 Jun 1815 in Mansfield) Betsey’s parents were Samuel Fisher (1733 – ) and Mary Tucker (1741 – 1809). Ebenezer and Betsey had nine children born between 1794 and 1813. Richardson, Ebenezer, Mansfield. Private, Capt. Israel Trow’s co., Col. John Hathaway’s regt. ; service, 21 days, in April and May, 1777, at Rhode Island; said Richardson reported as among those who did not agree to tarry 2 months, and 2 days (38 miles) travel was allowed him to return home; company raised in Bristol Co.; also, Capt. Abiel Clap’s co., Col. Thomas Carpenter‘s 1st Bristol Regiment; service, 34 days; company marched to Rhode Island July 24, 1777 ; also, Capt. Silas Cobb’s co., Col. Danforth Keyes’s regt. ; enlisted Sept. 2, 1777; service to Jan. 2, 1778, 3 mos. 29 days, at Rhode Island; also, same co. and regt. ; pay roll for Dec., 1777, sworn to at Providence; also, Capt. John Dean’s co.(4th Bristol Co.), Col. Isaac Dean’s regiment; entered service Aug. 1, 1780; discharged Aug. 7, 1780; service, 9 days, at Rhode Island on the alarm of Aug 1, 1780; also, Capt. Josiah Keith’s co., Col. Isaac Dean’s regt. ; entered service March 4, 1781; discharged March 16, 1781; service, 13 days; regiment raised in Bristol Co. for service at Rhode Island by order of His Excellency John Hancock. In the 1800 census, Solomon was head of a household of six in Wrentham, Norfolk, Mass. ix. Benjamin Richardson b. 12 Jan 1771 Attleboro, Bristol, Mass; m. 19 Aug 1794 in Attleboro to Rachel Rounds (b. 9 May 1776 in Rehoboth, Bristol, Mass. – d. 19 Mar 1834 in Rehoboth, Bristol, Mass.) Rachel’s parents were Hezekiah Rounds (1752 – 1818) and Mary Wheeler (1756 – 1841). Benjamin and Rachel had six children born between 1798 and 1808.
x. Roxalana (Lena, Roxa, Roxselena) Richardson (b. 2 Nov 1773 in Attleboro, Bristol, Mass – d. 7 Aug 1852 in Attleboro); m. 22 Oct 1797 Attleboro to Abijah Hall (b. 1776 Attleboro) Roxalana and Abijah had four children born between 1796 and 1804. Roxelana (1506 – 1588) was the wife and haseki sultan of Suleiman the Magnificent and mother of Şehzade Mehmed, Mihrimah Sultan,Selim II, Şehzade Beyazıt and Şehzade Cihangir. She is well-known both in modern Turkey and in the West, and is the subject of many artistic works. She has inspired paintings, musical works (including Joseph Haydn’s Symphony No. 63), an opera by Denys Sichynsky, a ballet, plays, and several novels written mainly in Ukrainian, but also in English, French, and German. Roxanna was the Bactrian princess and wife of Alexander the Great. Stephen Fuller (1742 – ) was proprietor of the Half Way House in Walpole, Mass. a place for stage coaches to stop on their journey between Boston and Providence. In the 1850 census, Anna was living with four of her children ages 21 to 38 and her sister-in-law Mary Fuller (b. 1781) in Attleboro, Mass. xi. Jonas Richardson b. 4 Mar 1777 Attleboro, Bristol, Mass; d. 1837 or 1 Dec 1847 Mansfield, Bristol, Mass; m. 17 Nov 1805 in Attleboro to Prudence Stanley (b. 12 Aug 1785 – d. 15 Oct 1845 in Attleboro of jaundice) Jonas and Prudie had three children born between 1805 and 1810. This entry was posted in 10th Generation, Historical Monument, Line - Shaw and tagged Attleboro, Col. Danforth Keye's Regiment, Col. Isaac Dean's Regiment, Col. Jedediah Huntington's Regiment, Col. John Daggett's Regiment, Col. John Hathaway's Regiment, Col. Joseph Reed's Regiment, Col. Samuel Wyllys's Regiment, Col. Thomas Carpenter's Regiment, Col. William Shepard's Regiment, General John Balkam, Mexico Oswego NY, Woburn. Bookmark the permalink.